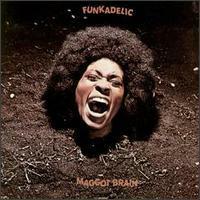 Maggot Brain is the third studio album by the American funk band Funkadelic, released in 1971 on Westbound Records. The album incorporates musical elements of psychedelia, rock, gospel, and soul music, with significant variation between each track. Pitchfork Media named it the seventeenth best album of the 1970s. In 2003, the album was ranked number 486 on Rolling Stone magazine's list of the 500 greatest albums of all time.